The "State of the Art" - an impression - Wisdom, sleeping..
What verified knowledge do we have today about wisdom? What progress was brought to its explication by the serious researchers and scholars? Or did the sages of the great religions do better? I found that the knowledge about wisdom, far from being presented in harmonious systems or as great rational edifices is still a true Tower of Babel eternally abandoned in mid-construction, pray to the confusion of words and the stiffness of views. I did and continue doing my reading about wisdom and I am not satisfied. For recent centuries wisdom appears to be a subject forgot or denied in philosophy and the social sciences, abandoned to the impostors. (This abandonment was strikingly true at the time I started my study; but now, at the beginning of the 21st century I am happy to observe a sudden revival of interest). The main views about wisdom - and the treasury chest containing millennia of wise thoughts - are still asleep. Fortunately, they are protected from stupid oblivion because they are buried into the common sense of the daily life mind, in the folklore, myth, literature of the nations and particularly in the sacred writs of the religions. ​This storehouse keeps being neglected, or worse, despised by the new science that grew from the enthusiasm of the Enlightenment. 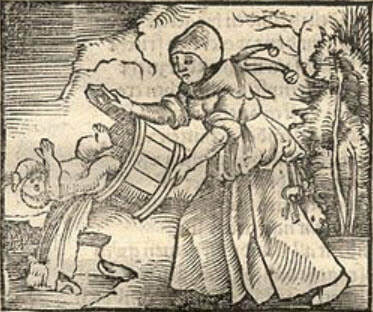 Some of our best intellects were so keen of freeing Man from superstition and slavery to the past that – to get rid of that past - they threw out with its soiled water the baby too. ​Strangely, those geniuses of emancipation confused not parroting tradition with not learning from it. ​Unfortunately, wisdom is essentially tradition from which we learned, to retain that which works and not to repeat that which was mistaken. No, wisdom is not the irrational idol to get rid of in order to free humanity, It is Humanity learning from personal experiences of life. The new idol of dry Rationality working to free itself of things human is not a replacement for the good sense of reasonable humane reflection about the world as we experience it. You cannot have a true, substantial image of what wisdom is without considering two traditions of cultural heritage – common sense expressed in wise words and millennia of good sense historically amassed in the thoughts of the Wise. Alas, spirit, soul, the imagined, myth, ritual, the great narrations, the beautiful, do not seem to fit scientific method. It is difficult to turn into scientific research our modern intuition that from perception and from data we need to extract information, from information we seek knowledge, from knowledge - understanding and from understanding we want to gain wisdom. Better said, scientific dogma is still unable to include them in its scope with due respect. What a chance that religion, art and literature keep remembering and increasing the treasury! Luckily, theologians, study wisdom constantly because it is so present in the religious corpora. They keep praying that it is God’s word. This work is of inestimable value, it saves past understanding from oblivion. Luckily folklore too survives time. However, the folk-philosophy of the ages does not satisfy critical examination or learning fit to our epoch. I expected to find in the current research, since 1980, new ground breaking wisdom, at least some illuminating definitions; something useful to understand better and to develop one's wisdom rationally. I did not find much. In spite of recent interest for wisdom, the scientific treatment looks still disappointing to me. Only the nineties, when some dogmatic guards of mechanistic narrow-mindedness grew old or died out, saw a sudden revival of interest for wisdom, folk-psychology and common sense. Now, at the time I write, great doors appear open anew. Suddenly there is new confidence it the powers of human mind. Recently, I guess that some authors had the courage to endanger their academic record; they made research, studied, remembered this forgotten and devalued field and published a few excellent books - a huge progress from the deafening silence that fell upon wisdom after the Enlightenment . Something started moving. After a declining interest of several centuries, the academic study of wisdom, recently reborn by philosophers - epistemologists and ethicists. For the time being, academic study does not give a satisfying answer to what wisdom is, nor to how it works or where to find it. What I came upon was bits and pieces of dry, scientifically correct theories and disappointing simplifications. With due respect, it still looks to me very much like the Buddhist parable of the blind men feeling the elephant with their fingers. Psychologists (those not obnubilated by "behaviour") touch the eyes and say that wisdom is nothing but knowledge in important matters of life with a shade of value given to living well. Ethicists hear the heart and discern the beat of old virtues (not all of them, I found writings of bold new thought). Cognitive science, neuroscience are rising now with renewed enthusiasm to reduce mind to matter, to eliminate selfhood and conscience, to order the brain like an algorithm crunching computer instead of the opposite. Amazingly, the IT engineers are the first to explain that the brain is not a computer and that imitating commonsense mind must replace the utopia of logic perfection forced upon the living human mind to correct the “weakness” of human reasoning. All these honourable searchers still bow servile to the Scientific Method of the XXth century and toil to define wisdom in terms of dry reason, passive copy of and mere response to the supreme material reality or, more recently, nervous system wirings and firings and chemistry at work. They pain to describe the human mind in clear concepts, hypotheses and operational terms to better size it up explain it, and pin it down to palpable matter, energy and information. They all itch to reduce wisdom to knowledge, to justified and verified beliefs and its functioning to measurable processes, overt behaviour and skill. God protect us from the person, the individual, the soul, consciousness and even from “mind” - since we do not have access to study them! As for that great content of millenarian past experience left by the humans - the wise utterances that should be treasured by History - they do not compute. Accepting that some things should be understood, comprehended, imagined with empathy, instead of being measured and explained, still appears like mystical heresy. Why bother to study the statements and metaphors of wisdom instead of neglecting them, to check objectively by trying them out, whether they are true or false belief? As it seems, modern positivists cannot acknowledge that the half-natural half-social common sense functioning of the human mind, its intuitions and feelings, its imaginings and common places, its intuitions, analogies, short-cuts, metaphors, undecidable valuations and unfalsifiable religious beliefs  could contain or generate something of value, something which counts. This is perplexing for me – an agnostic - since I observe that the greatest known sages of all times where founders of religions. Endless numbers of wise people were and are deeply religious. The greatest scientists of history seem to have been deists too or at least respectful and prudent towards religion and Spirit. It appears moreover that moderate religious conformity did result in multitudes of simple people living wisely, with some hope to guide them. I do not believe at all that wisdom is something superlative and general, floating high above our heads, sacred or abstract meta knowledge or meta virtue. I sense that wisdom is not a linear phenomenon denoted by a concept but a way of being in the world, one opposed to brutish survival and predation. The phenomenon we call wisdom is active only while it is alive, in a context, not independent of people. It is a mode of living persons’ learning, thinking, feeling and vision of the world. It is work and action with an open-minded, broad and high view. Wisdom is defined by persons-centred orientation, norms and priorities. It is human, maybe too human; certainly too human to be an abstract theory. In history, there seems to be, curiously, not a progression of wisdom by orderly one-way accumulation of humanity's knowledge but an ebb and flow, an eternal return and decline of wise attitude, periodically reborn and perpetuated by loose filiations of wise ones. I would compare it with great literature seen by Harold Bloom. I think that all those sages work again and again to re-educate Man to be civilised, to rise - by spirit, by faith by good feeling or by culture - above the beast from which we evolved naturally. They all found or invented and spread ways of living, lives worthy to be called human and meaningful. I learn from them that to be wise is to be civilised, not only informed, skilled and numerate. If we chose to look at it in the abstract, wisdom must be understanding, mindset, method, doctrine, strategy, style, for living well. Maybe not one doctrine, not one wisdom but several ways of wisdom. I am suspicious of the compulsion to define the one and only one wisdom or to differentiate a complete set of sufficient and necessary parts that must be present and concur to define wisdom. Why is it so difficult to conceive that wisdom exists in many ways and fields? That there was and is today more than one culture on Earth? Common sense accepts that there is more than one way of being wise. Does universal science have to take over the monotheistic concept of unique, omniscient, omnipotent and all-good divine wisdom? Must we say that there is one truth and one wisdom only reflecting it? That its’ last prophet is Reason? Do the disciplined authors of the day, cherish an unquestioned faith of some “high” mental process reflecting the world? I sense that wisdom is not mere reflection of that which is. I believe that wisdom – even the strictly rational part of it - also invents, and gives meaning, informs, organises, builds, changes and thus creates our world. We should conceive wise thinking as a way the human mind looks at the world, understands it, organises it from human and personal points of view so that the world makes sense to Homo Sapiens, so that knowing it helps us to live meaningful life. The square box of mechanic materialism with which I was presented in my youth is too small and awkward for this sweeping and animate object of study. Frankly, Plato, Socrates and Aristotle, their offspring, did better when they wrote their extraordinary minds without peer reviews. More spacious method is needed; more in-disciplined and tolerant interdisciplinary synthesis. I resolve as I contemplate this situation that I would not waste my late years studying everything (including loads of nonsense) like an ant and arguing with mainstream scientific methodology, with the already fading positive rationalism in social sciences. I will not waste my few years left writing text unreadable and unintelligible because it is interrupted by correct references of names and years every three words. All my sympathy to the wonderful people, the young researchers tortured to comply with this ugliness, lest they get eliminated by the academic system. But I am frustrated by the past century lost and decided to rebel against narrow-mindedness. To struggle with the monster institution of dogmatism my strategy is light cavalry; to embrace the "barbarian" attitude of common sense thinking. I live now and I think now. Laugh and feel superior, dear learned reader, take it as you like it! As long as I am not satisfied with the answers available, I will ask myself what wisdom is. I will trust the mysterious workings of my own mind. It will never be too late to correct my errors; for me or for other people wiser than me. "Tittha Sutta: Various Sectarians (1)" (Ud 6.4), translated from the Pali by John D. Ireland. Access to Insight, June 14, 2010, http://www.accesstoinsight.org/tipitaka/kn/ud/ud.6.04.irel.html. Or, variant: "Tittha Sutta: Various Sectarians (1)" (Ud 6.4), translated from the Pali by Thanissaro Bhikkhu. Access to Insight, July 8, 2010, http://www.accesstoinsight.org/tipitaka/kn/ud/ud.6.04.than.html. This metaphor was later reverberated more than a thousand years later by Sufi lore in The Walled Garden of Truth and the Masnavi of Rumi. I think of people like John Kekes, Paul Baltes, S. Ryan, Valerie Tiberius and certainly Robert Sternberg. Fehlt leider nur das geistige Band .